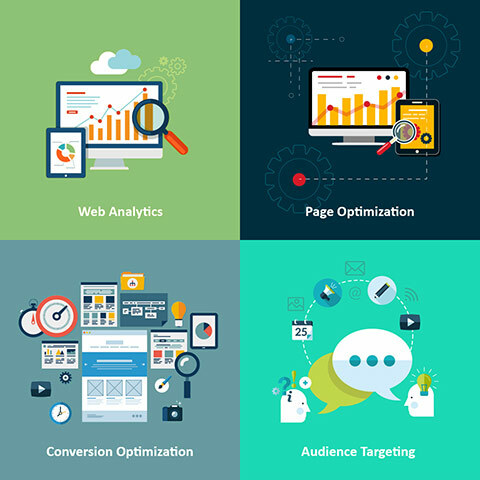 Conversion Optimization is a process which increases the percentage of visitors to your website that ‘convert’ into leads or customers. It involves making strategic changes to the layout, text and visuals of key pages, and improving the amount of visitors taking the required action on each page. Imagine if you could get more leads or sales from the same amount of traffic to your website. Every webpage can be improved, and the results will surprise even veteran website owners. Big changes often yield big results, but even seemingly small changes, such as changing the color of ‘action buttons’ and rewording the ‘call to action’ can improve your bottom line. In some cases, less means more. We often come across beautifully designed landing pages, which are laid out in a way that overwhelm and confuse the visitors, who leave without taking action. In most cases this happens when pages are created by a designer and not by an experienced marketer. The process begins with analyzing the sources of traffic, and matching the right landing page to the relevant audience. We then analyze the ‘flow’ of each page, making sure visitors are focused, engaged and getting exposed to the right headline or visual, at the right time. Our conversion experts help you identify weak spots in your marketing funnel, reduce bounce rate and shopping cart abandonment, and increase your overall website conversions. Our experienced copywriters help you craft a compelling ‘core message’ and effictive calls-to-action. Our talented designers add visuals, graphic elements and a touch of color that boost the trust and authority of your website, and eliminate any barriers and objections visitors might have. Conversion optimization is part science, part art and part experience. We know what works because we’ve done it before. To top it off, we use special software tools that track user behaviour and mouse movement on your landing pages, which enbale us to see where users click and what they look at on each and every page. Market Research: Researching and analyzing your target audience, traffic sources and user engagement. Producing conversion benchmarks and ‘desired actions’ for each webpage. Goals Setting: Implementing the conversion funnel, creating lead opt-in forms, evaluating copywriting for landing pages and making adjustments to website code. Analytics Funnels: Setting up advanced Analytics funnels to track goals and ROI. Creating lead capture forms, email follow-ups, special offers, and more. Landing Pages: Developing professional landing pages; including hosting, coding, web-design, content writing, lead-gen forms, and more. Professional Copywriting: Crafting a compelling core mesaage, value proposition, and effective call-to-action to maximize the results you can get from every webpage. Graphics and Visuals: Creating professional and engaging images and graphics that improve user experience and increase the trust and authority of your website. Split Testing: Creating new varients to existing landing pages, with strategic changes to the visuals and wording of the page. Spliting the traffic between the two versions, and measuring the results to find the “winning” version. User Engagement: Monitoring user behaviour on your website using special software tools that track mouse movement, heatmaps, scroll-maps and even produce real-time videos of actual users engaging with your website. Need an experienced team to optimize your website for conversions?